REUBEN P. BELL, whose portrait is present to the readers of this volume on the opposite page, is a retired farmer, occupying a beautiful house in Minonk, and is numbered among the wealthy men of Woodford County. He is a fine representative of those preserving, thrifty and prudent pioneers, who came to this section of the country when it was yet in its infancy, and while building up fine homes and enriching themselves, have also become important factors in developing the resources and aiding the prosperous growth of county and township. Mr. Bell is a native of Kentucky, born in Oldham County, March 31, 1810, to Robert F. and Mary (Pemberton) Bell, natives respectively of Pennsylvania and Kentucky. Joseph Bell, grandfather of our subject, also born in Pennsylvania, was a soldier of the War of the Revolution. He was a farmer by occupation, and in 1788 removed from his native State to Kentucky, becoming a pioneer thereof, and there he spent the remainder of his life, dying at the age of ninety-six years. To him and his wife were born eight children, seven of whom attained old age; Robert, father of our subject, was reared a farmer, and in 1809 married in Kentucky, remaining there several years after. In 1818 he removed with his family to Indiana, residing in that State until 1833, when he came to Illinois as one of its earliest settlers, and located in Putnam (now Marshall) County, where he had two years previously entered a tract of land, and there he and his wife passed their remaining days, she dying when fifty-one years old, and he at the age of seventy-nine years. Of their family of nine children, all grew to maturity, the following being their record: Reuben P.; Julia L., who married John Bates, died in Marshall County; Frances is the wife of John Wineteer, of Minonk; George F. died in Marshall County; Susan, who married William Myers, died in Marshall County; J. M. lives in Bureau County; John E. died in Minonk; Elizabeth, who married Jackson Laudterman, died near Springfield; Robert died in California. Reuben P., of this sketch, left his native State with his parents when a lad, and going to Harrison County, Indiana, finished his education and became a tiller of the soil. He continued an inmate of the parental home for some years, coming with his family to Illinois and settling in Marshall County. He was industrious, energetic, possessed of financial shrewdness, and with his ability to earn money, also had the faculty of saving it, two qualities not always combined in the same person. Continuing a resident of Marshall County, for many years, he in the meantime purchased and improved 400 acres of land, and accumulated a good property. In 1860 he came to Woodford County, and bought a tract of raw prairie land, which is now near the center of the city limits of Minonk, on which he built his commodious house, one of the finest in the place, the buildings and their attractive surroundings being indicative of the prosperity, excellent judgment and good taste of the occupants. Mr. Bell is also the owner of other real estate in Illinois, besides that already alluded to, the number of acres in his possession aggregating 1,500. Of this large property all has been amassed since he came to Illinois, and is due entirely to his own wise sagacity and true economy. Mr. Bell has been twice married. The maiden name of his first wife, to whom he was married in Marshall County, Illinois, in November 1837, was Nancy Palmer, a native of Indiana. She died in September 1844, leaving him with one child, Frances, now the wife of James Dennis, of Eureka. The second union of our subject took place April 1, 1847, when he was married to Miss Lydia A., daughter of Charles S. and Mary Edwards. Mr. and Mrs. Edwards were born in the United States, of Welsh origin. In 1831 they removed from Kentucky, where the birth of Mrs. Bell occurred December 31, 1827, to Marshall County, being among the pioneers of that county. 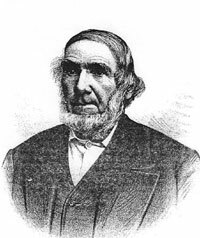 For a few years after coming to Illinois Mr. Edwards taught school, then engaged in farming, and is at present living in Rutland, at an advanced age, having been born April 1, 1806. Mrs. Edwards died at the age of sixty-nine years. They had a family of ten children, eight of whom grew to maturity, the following being their record: Lydia is the wife of our subject; William and James died in Lacon; Sarah, who married Norval Barnum, died in Whiteside County; John lives in Butler County, Nebraska; Charles lives in York, Nebraska; Robert lives in Lacon; Mary is the wife of J. H. Bovoort, of Rutland. To Mr. Bell and his present wife have been born two children, Sarah, wife of B. M. Stoddard, of Minonk, and Adelaide, wife of William S. Marquis, of Rock Island. See biographical sketch on BELA M. STODDARD. Mr. Bell cast his first Presidential vote in 1832 for Andrew Jackson, and has since then voted the Democratic ticket. He has taken much interest in local affairs, and has filled various township offices acceptably to all. Mrs. Bell is an esteemed member of the Presbyterian Church. In 1867 Mr. Bell built the house that is still standing at the northwest corner of Mary and East Fourth Street. This house was originally built at the northeast corner of Maple and East Fourth Street but was moved so that a new house could be built at that location by Mr. Bell's grandson, Reuben Bell Stoddard.